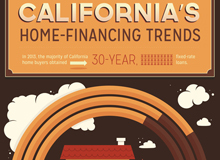 According to CAR’s 2013 Home Buyer’s Survey, majority of California home buyers obtained a 30-year fixed-rate loans in 2013. The average down payment was 25%. 83% of buyers had no problems with their appraisal. 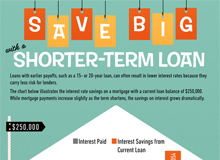 85% of buyers obtained a 30-year loan. 91% of buyers obtained a fixed rate loan. 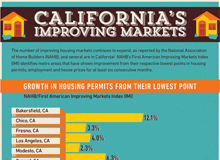 California Association of Realtors Published on Jul 8, 2013 California Association of Realtors C.A.R. 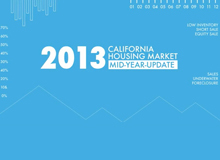 Chief Economist Leslie Appleton-Young presents the mid-year 2013 housing market data for California. Buying vs Renting Monthly mortgage payments for the typical U.S. home currently compare more favorably to rents than at any time since the early 1970s. 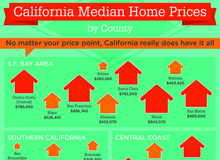 In California, prices vary widely by region. 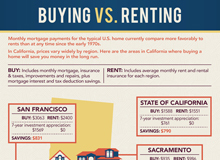 Here are the areas in California where buying a home will save you money in the long run.